The most accurate (i.e. concentric) manner of turning is between centers. 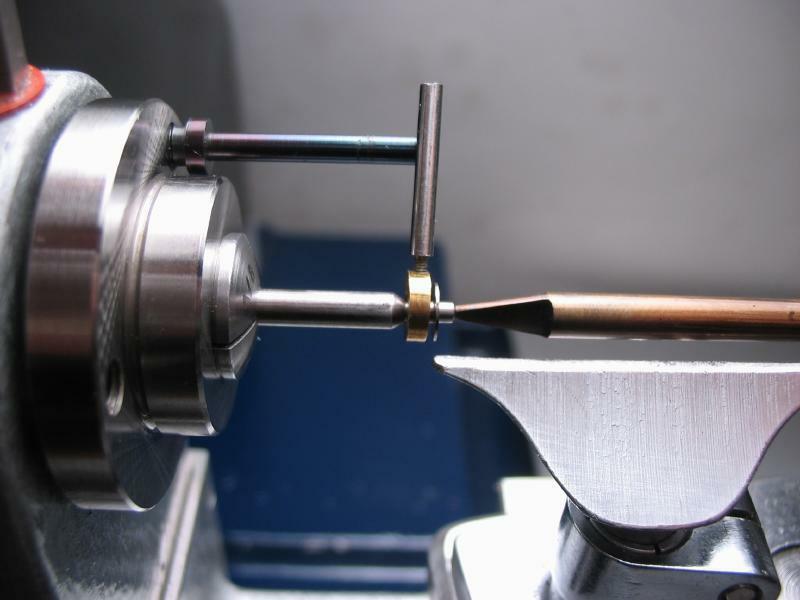 The work is usually started by another method (in a collet or chuck) to give the basic shape and to impart on both ends; points (male) or center drilled (female). This allows the part to be then mounted between points or cones (male or female centers) which are held in the headstock and tailstock. A means of driving the part is needed and can be either turned with the cross slide or by hand with a graver on the T-rest. This page is to discuss the latter. Hand turning between centers on the Cowells requires some preparation. For regular hand turning without tailstock support, the cross slide can simply be wound to the back of the lathe bed to provide sufficient room to mount the T-rest. However, for tailstock support the cross slide must be removed. 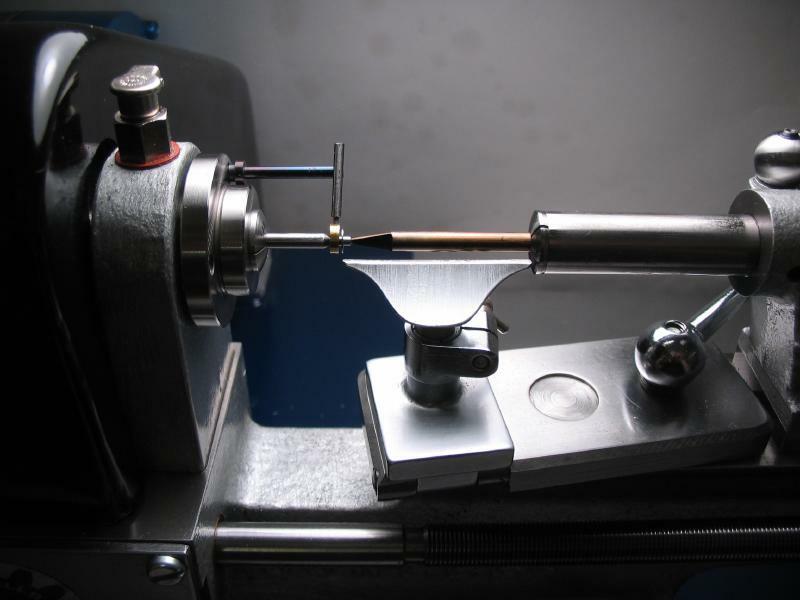 On a standard watchmaker's lathe, the cross slide and T-rest mount to the bed via a simple bolt which protrudes through the center of the bed. The Cowells cross slide is mated to the bed by the saddle, and removal is a bit of a chore, although after doing it a few times, it only takes several minutes. 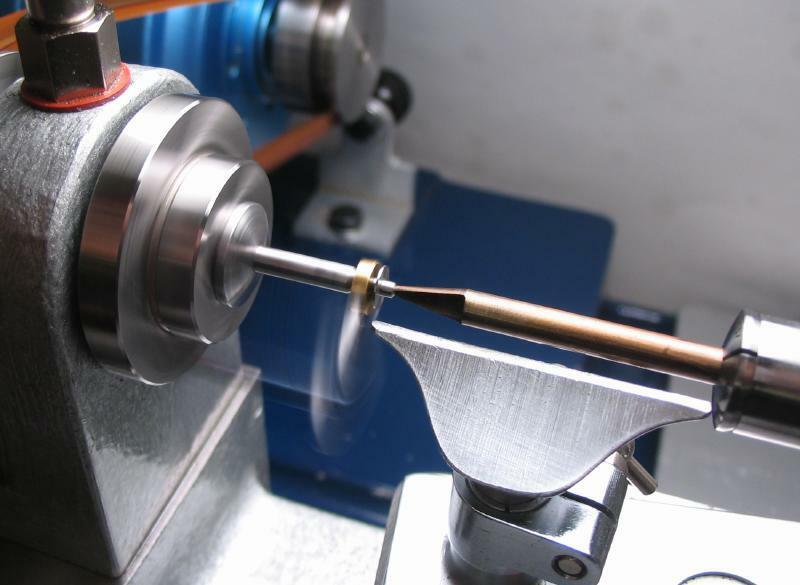 This process is detailed on the lathe maintenance page, and has the following steps: The leadscrew handwheel must be removed, the follower bracket of the cross slide saddle is unbolted, the tailstock removed, and the saddle gib screws slackened. The cross slide is then slide off the bed, and the tailstock replaced. 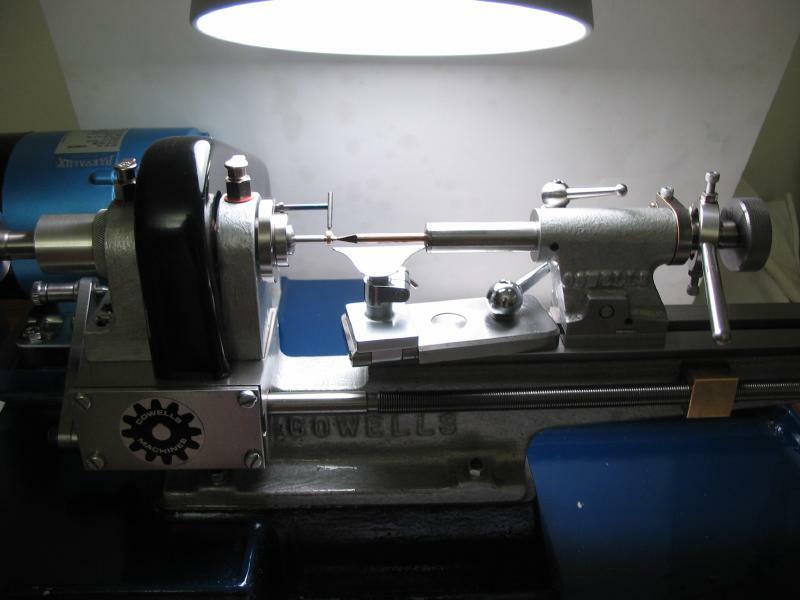 Cowells does not offer any center turning accessories of the size needed for very small, watch size turning. These are not difficult to make, however. On other pages of this site I demonstrated the carrier chuck, hand made by another machinist, which is similar to carrier chucks made by other lathe makers (e.g. Steiner and Bergeon). While looking at the front of the headstock, it occurred to me that it could be used as a carrier/driver itself. The headstock on the current 90CW has a flange with three threaded mounting holes for attaching the chuck adapter. One of these holes could be used to mount a driving pin, and a center could simply be held in a collet. The drive pin shown below, was made from 5mm O-1 drill rod and threaded M4x0.7mm to fit a hole in the flange. It was turned down to 2.5mm and to a length convenient to reach the dog on the part being turned. It was hardened and tempered to dark blue. There are numerous possibilities that can be designed on this basic arrangement. For example, different lengths, or bent/hinged to reach closer to the center, etc. As I make and experiment with other variations, I will post them here as well. Various sizes of male and female centers can be easily made from drill rod to suit the work at hand. For the headstock, they are simply held in the same collet that was used to make them. For tailstock support, a fairly long center is needed. The T-rest made by Cowells is designed to overhang and bridge the bed gap, for turning close to the headstock. Therefore being fairly long, this design makes it tricky for the tailstock to reach the work. Just as with the headstock, various sizes of male and female centers can be made for the tailstock. Shown below is a female center, it was made from 4mm O-1 drill rod, and was center drilled with a Keo brand #00000 combination countersink-center drill (0.254mm x 60 degrees). It was drilled on both ends and a 20 degree taper given to each end, one end was then filed flat using the roller filing rest to provide ample clearance when turning close to center tip. It was hardened and tempered to straw, to provide extra rigidity. I tend to leave such items in their finished, tempered color, as a reminder to myself that I did it and for future reference, if it works well, then it will be easier to reproduce, and if it turns out to be too soft or hard, etc., it is easier to make adjustments. Purists, on the other hand, may re-polish these sorts of things, but in many cases it does not improve their function.